The Gray Matter Series began with the Fall 2017 collection of gray hats and colorful abstract paintings from Ruby3 by Anna Lee, and is ultimately an #artasfashion / #fashionasart photographic collaboration between creative souls that Miss Lee has worked with over the years. The pop-up gallery and retail experience featured the final products of this collaboration, as well as the work of each of the designers and artists involved during MN Fashion Week 2017. Creative collaboration is the stuff we dream about. 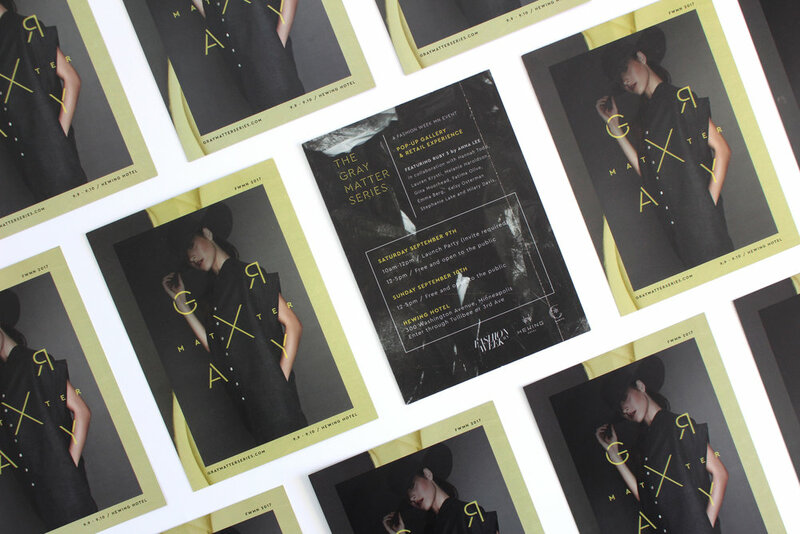 The Gray Matter Series allowed us to partner with a group of talented creatives and brought to life this special event for Minnesota Fashion Week in 2017. For the event we created a set of large scale images to feature the collective work of Designer/Miliner: Anna Lee, Fashion Designer: House of Gina Marie and Jewelry Designer: Stephanie Lake. The images were displayed alongside curated product assortments by the designers at the Hewing Hotel in Minneapolis. To promote the event we developed an iconic logo and application system with flexibility to allow it to continue on as the series continues to grow and evolve.